The new Baader Planetarium Click-Lock Eyepiece Clamp is a precision clamping eyepiece holder that enables you to insert your eyepieces or standard 1.25" accessories anywhere within the ASTRO T-2 System™, or for upgrading the stock holder supplied with telescopes. The Click-Lock clamp offers a brand new approach to eyepiece holders. Once you try one, you'll never go back to simple set screw or even captive brass clamp rings again! With a gentle twist of the outer ring, two special non-marring rollers come into contact with the eyepiece and firmly lock it into the holder. The 3-point clamp action guarantees none of the eyepiece wobble common in all single screw clamps or Takahashi lockring style holders. The lack of a protruding lock screw also eliminates one of the annoying hassles of standard holders - no more contortions trying to trying to work your nose around an inconveniently positioned screw. 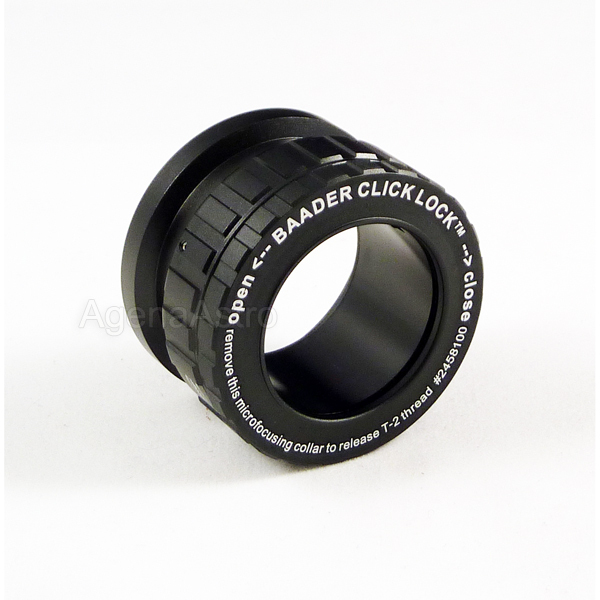 Baader Click-Lock Eyepiece Clamp makes a superior replacement for the stock eyepiece holders supplied with popular telescopes. Owners of Takahashi telescopes will find our Deluxe Eyepiece Clamp far superior to the stock Takahashi eyepiece holder, which is frustrating to use (and even allows eyepiece wobble which is particularly bad for guidescope use). See Telescope Adapters, below, for threaded adapters to mate to your specific telescope. 4.6 (Based on 10 Reviews) 80% of reviewers recommended this product. I don't trust a thumbscrew to hold an expensive eyepiece and camera. This Baader locks up tight! Simple to use in the dark. Worth the expense. This is a great eyepiece holder but the "adjustable micro-focusing collar" description is miss leading. It is not a micro-focusser, it's just an overall distance adjustment, usefull to set diopter on a binoviewer setup but not as a tiny fine tuning focusser one could use at the back of an sct. 5.0 Wouldn&#x27;t do with out it! Yes, a bit pricey, but far superior to knob and clamp eyepiece holders. Easy to install. Shipped fast. Agena is excellent to deal with and fast even when ordering from Canada. The Baader click lock is a superb piece of kit just what I needed to hold my Lodestar guide camera in place in my off axis guider. I got this to go with my T2 BBHS diagonal. I can't believe how much faster and easier it is to swap eyepieces with this, especially while wearing gloves. It doesn't grab as tightly as I would have expected. Although the eyepiece is extremely secure and centered perfectly, you can still rotate the eyepiece relatively easily. But, if you try one, I'm sure you will love it and never want to go back. Review by Procyon of Canada. 5.0 Once it's on, it stays on! Great Buy! This is one of the best accessory buys I have made related to Astronomy products. You never need be troubled by scratching your EP with screws ever again. A must have, even for binoviewing, solid support unless you sit on it, obviously. It's that solid. I bought this because I thought it had 3 locking rollers inside to give a nice, symmetrical fit around the center of the optical axis. It only has two. So, they press against whatever is put into the adapter and force it to lock against the opposite side. I first tried a relatively long EP. It was a fairly tight fit even before engaging the two-roller locking mechanism. If you have something to go in this adapter that may be a little oversized, it ain't gonna fit!! My first test was to lock the EP in the adapter, and then try to pull it out. I was able to do that, which really surprised me. I am disappointed with Baader's engineering and design of this adapter. I would not trust it with anything heavy, especially if the scope is going to be pointing upwards. I am going to keep it because it can be used with lightweight loads, like visual kit. It's a nice-appearing adapter and seemingly well-made, but it doesn't perform as it should. This is a very nice piece of equipment that makes switching EPs effortless and fast. One short twist of the collar and the EP easily slides in or out of the holder. It provides a secure, mar-free method of holding the EP dead center in the diagonal. It is also part of the modular T-2 Baader system and is usable in many configurations.